The sun was streaming through the window of the dormitory when I awoke. Gregorian chant music and opera was playing in the background. One of the volunteers was singing along and happy with the new day. With the deep sleep I had just had, it was not too difficult to relax for a while before getting ready for the day’s walk. 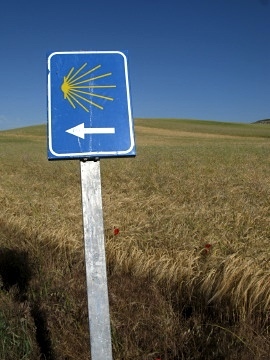 This is what the Camino was about. The two volunteers excelled in their hospitality and a good breakfast of bread, jam and coffee was awaiting upstairs in the main room. Tiziano had redone his bandages and his ankle was feeling a bit better. We said our goodbyes to the albergue staff and headed off with Mateja and Lorenzo to find the bus for Burgos. Mateja had been planning to leave a few days ago to catch her flight home from Madrid. She was torn. 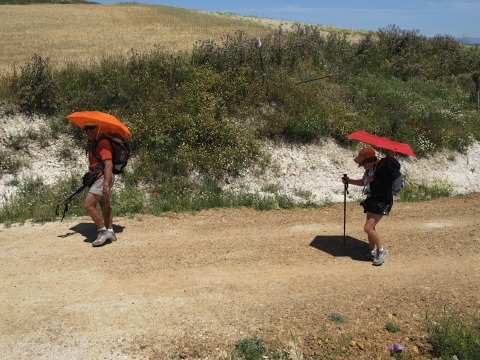 She did not want to stop walking as she was enjoying the Mesetas and the Camino so much. We found the bus stop and waited till the bus arrived. After talking to the driver she decided to continue walking. She could get a bus down the track in Fromista that would get her to Madrid in time for the flight. 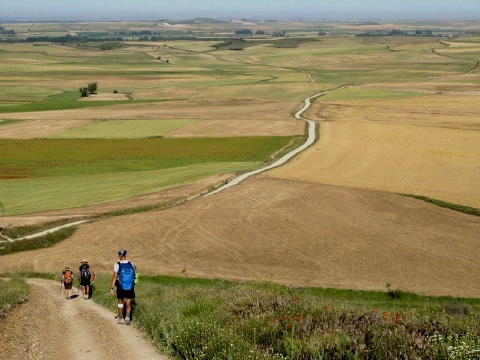 The lure of the Camino was just too great to stop just yet. As we saw the night before, the Way did indeed climb steeply at first. The country was becoming more magnificent and more relaxing. At the top of the climb everyone stopped to look back at where they had come from and where they were going to next. It was a timeless journey. This was the true Meseta. This was the true spirit of what we were doing. 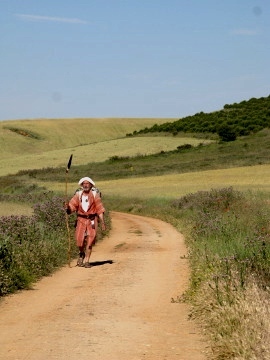 A short distance later I passed a pilgrim heading in the opposite direction. 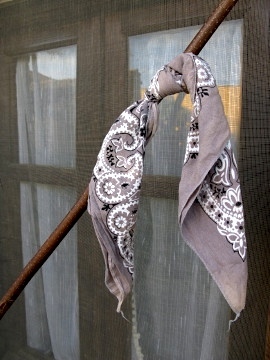 He was clothed traditionally with a long beard and carrying a long staff. He said hello and smiled as he continued on his way. I was fascinated too in the detail of the flowers, rocks and insects in the bright early morning light. The next summit provided refreshments. An enterprising local had set up a stall in the middle of this vast land to offer the pilgrims, for a donation, either coffee, tea or fruit. There was a shady sitting area opposite the stall. 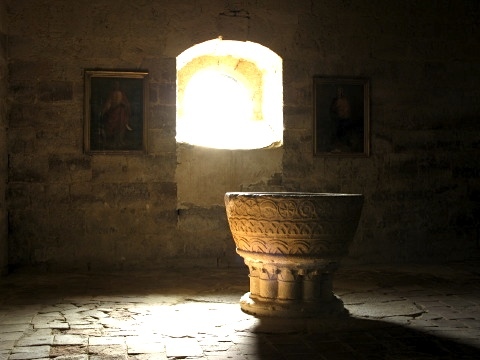 The atmosphere of the Way of Saint James was really present. A wide river appeared just before the village of Itero de la Vega. There was a ancient pilgrim hospital before the old bridge – the Hospital San Nicolas, now a small refuge run by the Italian Confraternity of Saint James. The village was quiet with only pilgrims passing through. I found a supermarket to stock up on my favourite bread and olive oil soaked sardines. It would be a few kilometres crunching over the dry pebbled track to the next rise and I could see trees ahead on the ridge – a perfect place to have lunch. The small wood was indeed perfect. Just off the way there were a few small pine trees with the dry wind making a calm rustling sound through their branches. I set up the gas stove as Lorenzo caught up. We chatted for a while about photography once more as we heated some coffee. An Italian couple I had met a few times passed with bright red sun brollies protecting them from the sun. Continuing on there was less shade so the Italians did not look so daft after all!. The track was wide and stoney and the heat was stifling. In the distance we could see building cumulus clouds over the mountains to the North. The forecast predicted rain within two days and in the current heat the thought was a welcome one. Lorenzo wanted to walk on and as he was walking faster than me we agreed to meet up later. ‘Each one their own Camino’ as the saying goes. I had heard about a good albergue with a swimming pool in Boadilla del Camino. The temptation to stay there and have a swim was just too much to resist. I reached the village quite late in the evening as the sun was loosing its heat. It was a fabulous place with a huge lawn and, as promised, a (small) swimming pool. 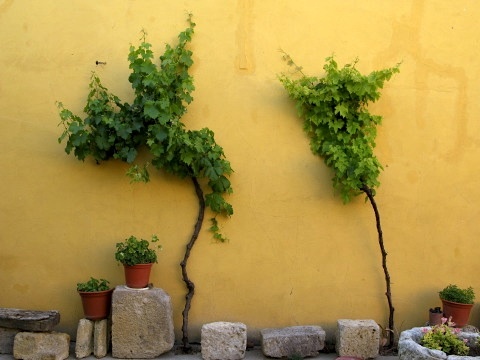 The garden was full of modern art and the plant life decorative and artistic. 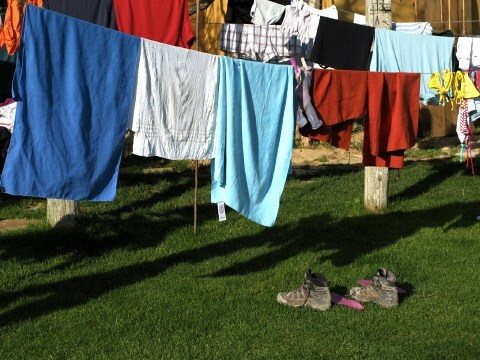 The day’s washing completed I set about putting it out to dry. I was disappointed that there was a large group of loud tourists, not pilgrims, jumping and screaming around the pool. They were having fun but most felt that they were credit card pilgrims not in tune with the Way. I never did get my swim but a cold shower was equally welcome. I met up with Patricia from Hungary who took great pains in educating me about Saint Francis of Assisi. She was knowledgeable about the history and legend to say the least. 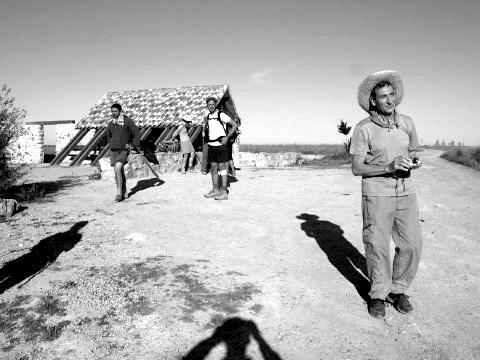 TIP: Its worth carrying a good guide that details the history and architecture of the Way of Saint James. I only had the Miam Miam Dodo and sometimes felt I was missing out on some of the richness of the journey. After dinner I wandered around town as the light provided the ‘magic hour’ for photography. 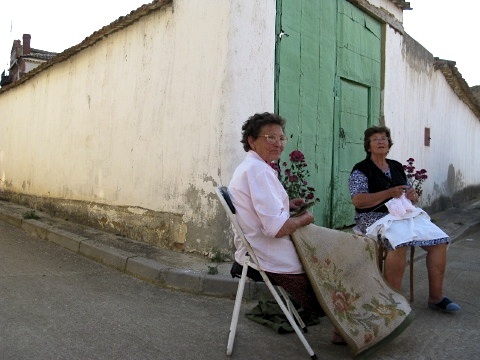 Three local ladies sat in the street talking and embroidering. After saying a few words in my broken Spanish, I headed back to listen to the swallows nightly dance round the church spire. I was transfixed by the peace and sat for over an hour in solitude as the last light of the day receded. I thought of many things then emptied my mind replacing the space with calm that only this journey can provide. 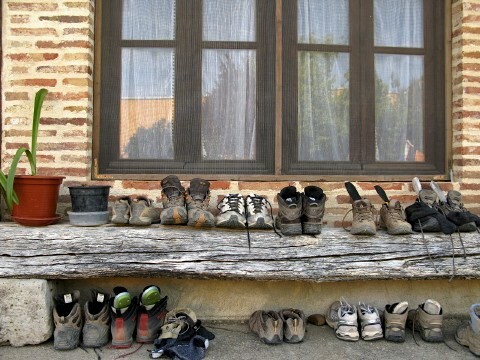 This entry was posted in From the Way and tagged Boadilla del Camino, Castrojeriz, Via Frances, Way of Saint James, Week Seven. Bookmark the permalink. Post a comment or leave a trackback: Trackback URL.